This may just be my opinion, but there is simply a major shortage of good historical fiction set in the 1920s. I've searched far and wide but have only found a measly number of books set in this fascinating time period. 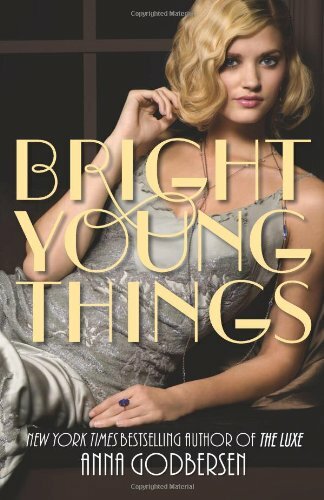 Bright Young Things is a star amongst these and in Anna Godbersen's usual fashion, the cover is simply fantastic! Letty and Cordelia are small town girls who escape from rural Ohio for New York City. They want to start new lives: Letty aspires to be famous and Cordelia desperately wants to find the man she thinks may be her father. They become separated not long after their arrival in New York and each take very different paths over the next few months. Cordelia is accepted back by her father who, as a very rich man, introduces her to a life of privilege and class she never could have imagined. Astrid, Cordelia's new brother's girlfriend who is hiding some secrets, also comes into play. Letty, on the other hand, is struggling to make it as a cigarette girl, a take-off point for her wishes of being famous. Death, love, betrayal, and fabulous historical imagery follow, all beautifully written. I'll admit that Letty and Cordelia's initial fight that led them to becoming split up for the majority of the book was hard to believe. They've been best friends for years, how could a little argument, especially when they've just arrived in an unfamiliar city, cause them to leave each other so quickly? Also, Cordelia's father immediately accepting her into the family made me a bit suspicious if he was up to something. Even if you aren't into historical fiction, I guarantee this story will draw you in. The characters are all so memorable and fun to follow, you'll be yearning more for the plot than the time period. I can't wait to read the next in the series! Also, if you have any recommendations for books taking place in the 1920s, please share them with us in a comment! Your right, there isn't enough fiction books set in the 1920s. Great review and I've now got this on my to-read list! i did love The Luxe, and it sounds like the author brings back some charming and easy to relate to characters with this one! plus there's flappers so obvs i'm interested. Great review. I actually just bought this book and can't wait to read it. The only book that I know of that takes place in the 1920s is The Great Gatsby. I agree with you wholeheartedly that there is a terribly lack of fiction in set in the 1920s but I think I will need to go read this book now! I am so keen to read this. i've heard that "vixen" is good. it's set in the 1920's and is a YA novel that was released a few years ago. I'd forgotten about that one Natalie! It's on my TBR list, hopefully to be read soon. Thanks for this review - sounds like this is a must for my TBR list. You might enjoy House at Riverton by Kate Morton. It's set in England between 1914 and 1930. If you like historical mystery with humor I'd recommend the Phryne Fisher -series by Kerry Greenwood. It starts in 1920s Australia. I can't wait until the other books in this series come out!